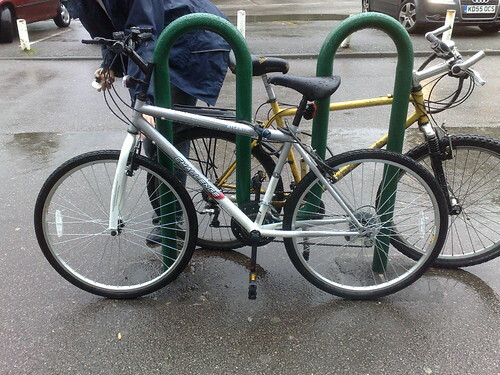 Asda style bike assembly, originally uploaded by mike1727. BBC TV consumer rights programme Watchdog has just run an article on assembling flatpack bikes bought from supermarkets for under £100. The article is fairly good, since the bikes are put together by normal, unbikeskilled people, just the sort of people who would mistakenly buy a cheap and nasty bike. "All of our volunteers struggled with their instructions and the tools often seemed inadequate for the job. All five made crucial mistakes that left their bikes unsafe to ride..."Whether it was down to our cyclists and their assembly, or problems with the individual bikes we happened to buy, they all ended up with faults that only someone in the know would be able to put right." There's a blog about BSOs here, here's a good article on the program in Bikeradar . And here's the evidence in the wild- outside the Quadrant shops in Marshalswick. While volunteering at a recent school bike safety event, I saw a handful of backwards mounted forks like this. Only a few bikes had adequate brakes -- they were scary dangerous. Firstly, apologies for leaving this comment on your blog (I couldn't find your contact details). Secondly, I'm just sending you a quick email to tell you how much I think your blog is fantastic and wanted to invite you to blog for a site we’ve just opened. As you’re one of the most prominent bloggers in your area, I just wanted to let you know personally that we recently launched www.stalbanspeople.co.uk. It’s a news and social networking site for St. Albans that anyone can join and add to and we’d love to see you on there, blogging about the happenings in your town. It would be great to see you there (and do please delete this comment once you've read it, I had no other way of contacting you :)) My email is serena [dot] obhrai [at] and [dot] co [dot] uk should you have any queries or questions.